up until recently I always used emby on my computer via the chrome app. I got a roku and downloaded the emby app to it and it plays ok, but many features are missing. For one thing I cant select subtitles or audio tracks. is this simply not do able? I'd like the roku interface to work just like the chrome interface. If I cant even select subtitles then the roku app is pretty much worthless. Posted in other topic also but this may help. Edited by Happy2Play, 18 November 2018 - 10:10 PM. too bad it has to map to a roku button instead of on the emby interface, oh well. You don't see it in the UI/OSD as discussed in second post of attached topic? Edited by Happy2Play, 18 November 2018 - 11:26 PM. So you expected to see the familiar "Audio & Subtitles" button like the old app? Or something else? On the video player On-Screen-Display (OSD) you can do this. To get there simply play the item, press down on your Roku remote, then navigate to the bottom row of action buttons. Choose the action you desire. These are the same action buttons used on all emby apps so they should be familiar. Are they? Do you find it hard to figure out how to get subtitles and audio stream changes to work for you? You said you also just got a Roku so it means you are new to Roku. We want to know on other Roku channels do you feel this same problem? Are we different than these other channels you use? Mostly in regards to how they allow you to choose subtitles and audio streams? I want to get a feeling how someone entirely new to Roku feels. We want to do better and better starts with most intuitive. Intuitive means no documentation is required because naturally you know how to use it. We want to be easy to use on the Roku. Please give more feedback on where you feel we are lacking. Thanks. Edited by speechles, 19 November 2018 - 01:54 AM. Hi. You don't see these buttons on your OSD? I did try the "+" button which worked, but a bit clumsy. I did not try the "down" button, I'll try that tonight. Yes I am new to roku. 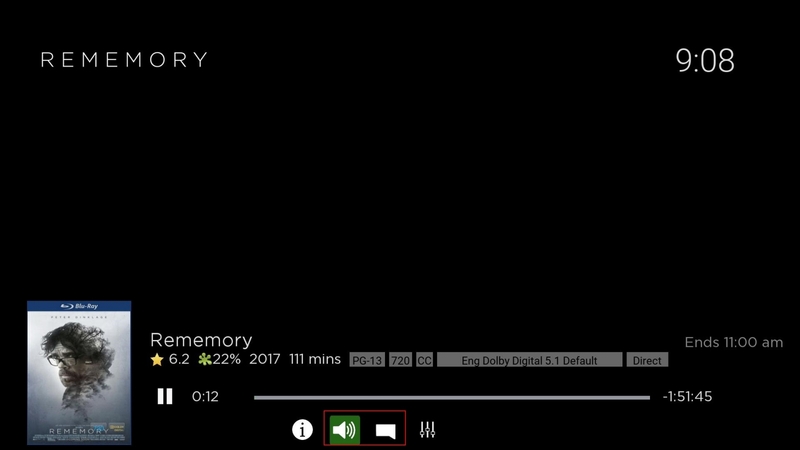 I expected the roku app to look and feel just like emby does on my computer. I did not know I had to push buttons on the roku controller to access things that are present on the computer interface but not on the emby app for roku. not the very bottom row. but I did not press the "down" key on the roku controller. Did not know I had to do that. was hoping the roku interface would be identical to the chrome version. not a big deal, just didnt know I had to push a button on the controller. I have never seen the SPEAKER icon. Is that new in the past few days? No. Been there since inception of this app. It will only be there if there are multiple audio tracks from which to choose, however. I think I have a file like that. I'll see if it works if indeed the file has different audio. I did see the OSD you show above when I hit the "down" button on the roku remote rather than the "*" button. I just wish the roku app could be just like the computer interface which is so nice, but I guess that is a roku limitation and not an emby thing. On the beautiful chrome interface I just set my parameters (if needed) and hit play. With roku you hit play first then interrupt the movie by setting parameters. Hi. Selecting those options before playback will be coming in a future update. However, you may want to look into your default settings for audio and subtitles on the server so that, perhaps, they can be selected how you want automatically.